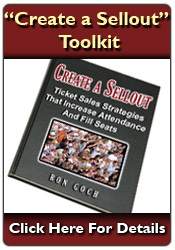 I’ve had many people ask if I’d consider making a complimentary chapter of the “Create A Sellout” eBookk Toolkit available so people can review some of the contents offered in the ticket sales toolkit. Every now and again, I receive an email from a friend sharing a short story. Like many I’m sure you receive, some are inspiring and impacting, and some you simply hit the delete key and move on with your day. This past week I received one of those “impacting” emails that once in a while move me to forward via email to those I believe will also appreciate the message.